RPU's 'Drag to the Future' show to be held Fri. In this photo from 2017, Jasmine Kennedie performs during the Rainbow Pride Union’s annual Drag Show. This year, the event will be held on Friday, March 16 in Chamber Hall in the Anderson Center. Students and community members will take the stage of the Anderson Center’s Chamber Hall on Friday, March 16 for a night of futuristic fun. Binghamton University’s Rainbow Pride Union (RPU) will be hosting its 16th annual drag show, “Drag to the Future.” Every year, the drag show offers a night of fashion, dance and lip syncing. Previous themes have ranged from fairy tales to decades, and participants usually plan their outfits and performances accordingly. This year’s aptly titled show will have a futuristic theme. Both student volunteers and paid professionals from the Binghamton area will be performing. Katrina, a local queen who has hosted the event for the past few years, will be returning to host. 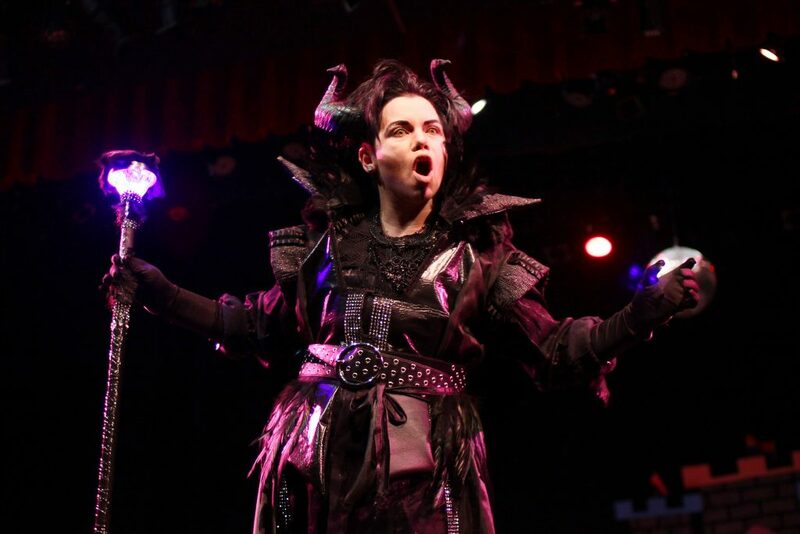 She will be joined by other professionals, including Lady Von Meer, a younger queen emerging on the scene, and Justin Saine, a king from the area. Brandon Bocanumenth, the president of RPU and a senior majoring in psychology, said that club members connect with local performers through weekly Thursday drag shows at Chatterbox, a tapas spot and oyster bar on Main Street. Bocanumenth said he was especially excited about the variety in this year’s slate of performers. “We usually just have a bunch of queens but never any kings, so it’s cool that we have a couple this year,” he said. The annual drag show is usually planned by RPU’s event coordinator, but this year, the club does not have an event coordinator. Instead, the president and vice president relied on notes and contacts made during previous years, which assisted them in reaching out to performers. Bocanumenth, who has been part of the club since his freshman year, said the planning process went smoothly because of all the connections made through previous shows. He said that student involvement in the Binghamton area drag scene and attendance at venues like Chatterbox have also been crucial to planning. Bocanumenth said the most challenging aspect of the planning process has been set design. The RPU Executive Board and general body members work together each year to build the sets, which are inspired by the theme. They were able to repurpose some of the set from last year, but a lot of new pieces have to be made each year because of the changing themes. “It’s open to anyone who wants to help, so each year we have a lot of people paint, make stuff and bring it to the Anderson Center,” Bocanumenth said. “It’s really cool that general body members come out and help”. The show is structured as a competition, with students and professionals competing in two separate categories. Winners are named based on audience votes, but participants and audience members can expect more lighthearted fun than cutthroat competition. Some performers take the show more seriously than others, but Bocanumenth insists that there is no right way to perform. “Drag to the Future” will be on Friday, March 16 at 8 p.m. in the Anderson Center’s Chamber Hall. Doors open at 7 p.m. Tickets will be sold in advance for $5 and at the door for $7.